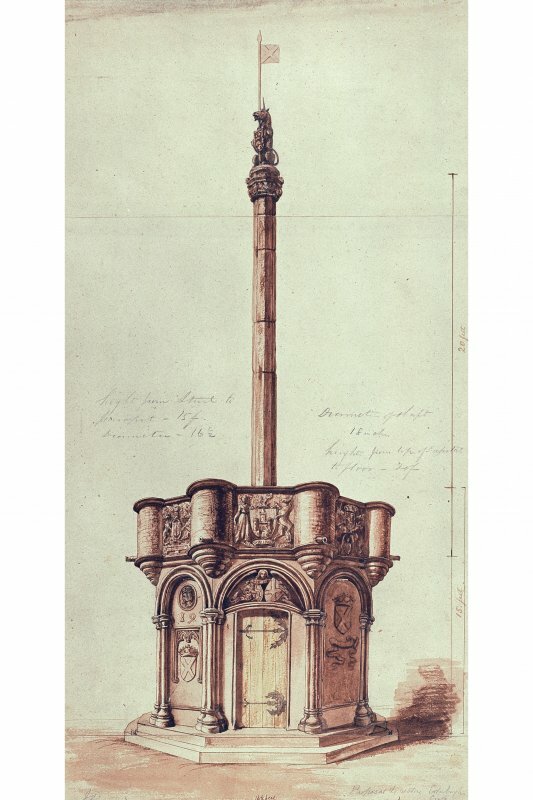 Drawing showing the proposed restoration of Edinburgh Market Cross. 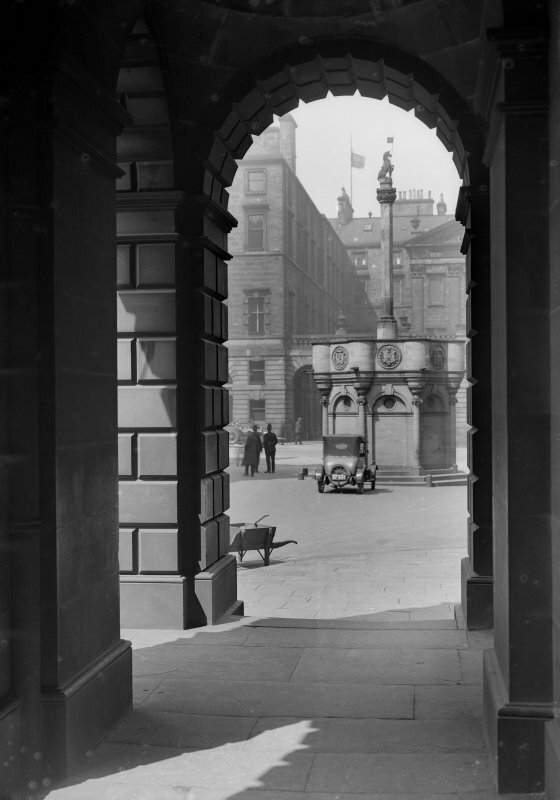 View of Market Cross with City Chambers in background, High Street, Edinburgh. 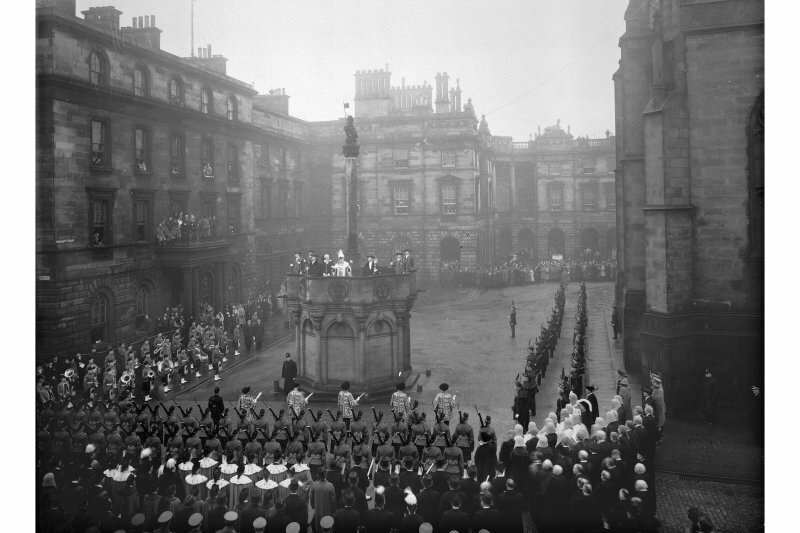 General view of Market Cross during ceremony, possibly the death of Edward VII. 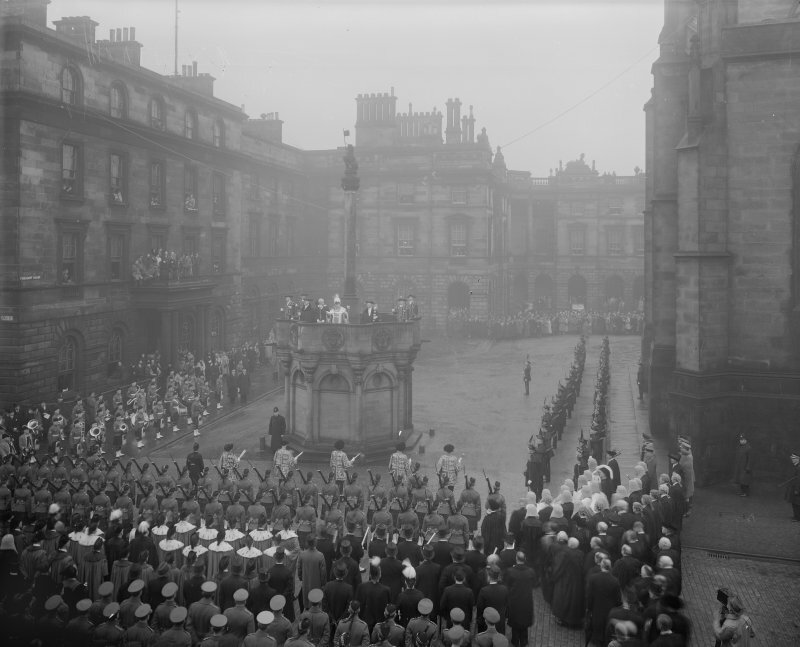 General view of ceremony at Market Cross - After the death of Queen Victoria and succession of Edward VII. 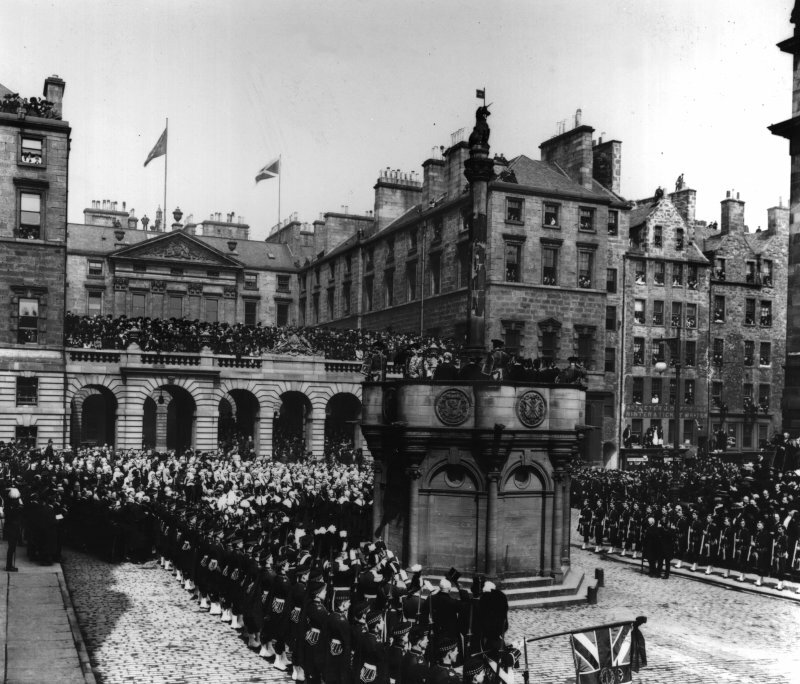 Proclamation of the Accession of King George VI.From left to right on Mercat cross, Captain HAB Lawson, Unicorn Pursuivant, Thomas Innes of Learney, Albany Herald, Sir Francis Grant, Lord Lyon King of Arms, Sir Alexander Hay Seton of Abercorn, Carrick Pursivant and Lt. Col. JW Balfour Paul, Falkland Pursuivant.Ceremony in Parliament SquareProclamation of the Accession of King George VI. 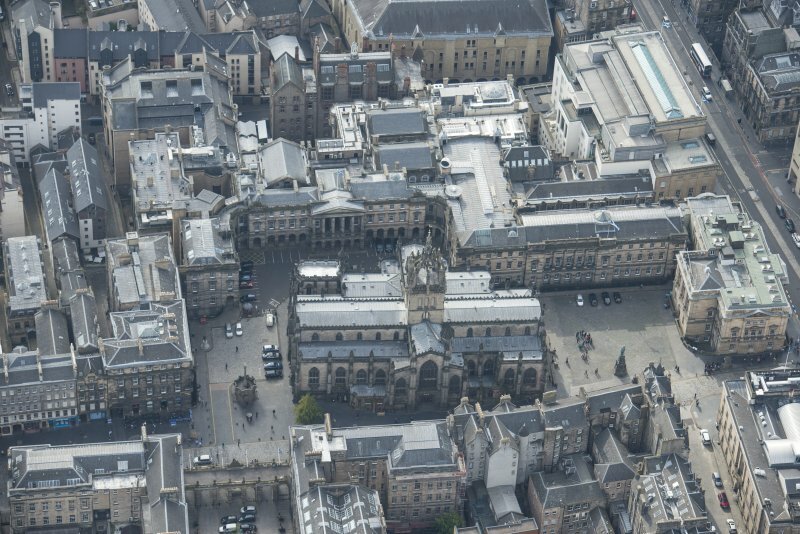 Oblique aerial view of the High Street, Parliament Square and St Giles Cathedral, looking WSW. 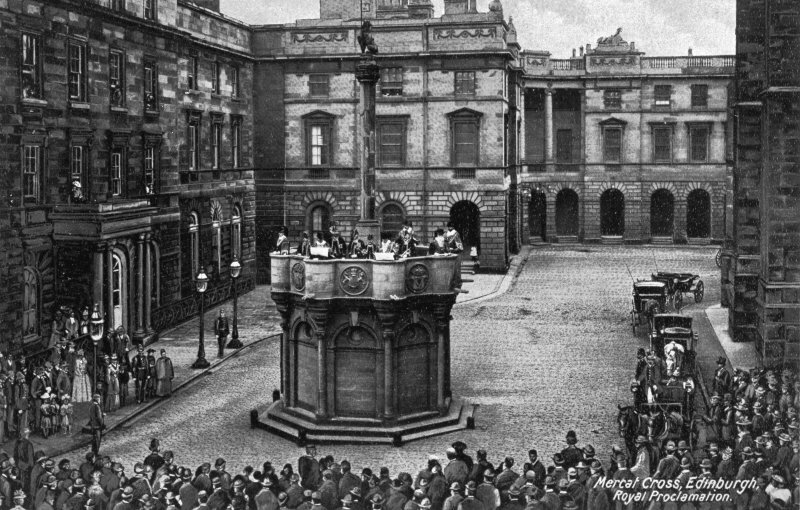 Market Cross.View from north (postcard). 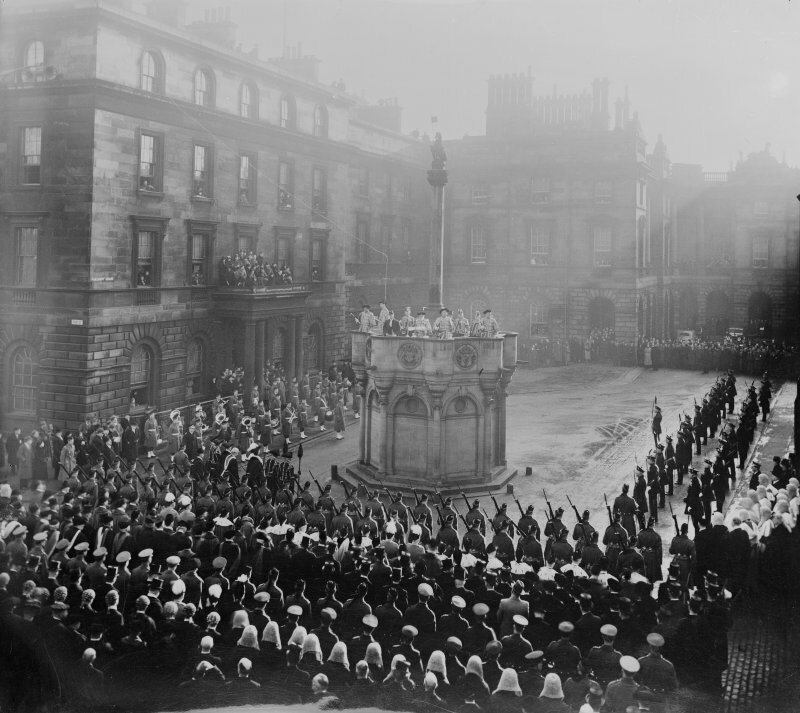 Insc: 'Mercat Cross, Edinburgh, Royal Proclamation'. 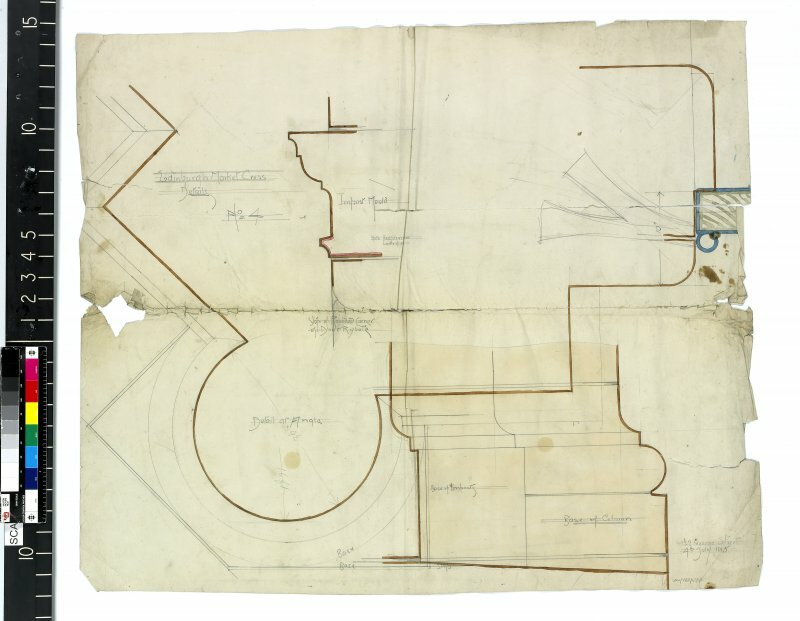 NMRS Survey of Private Collections. 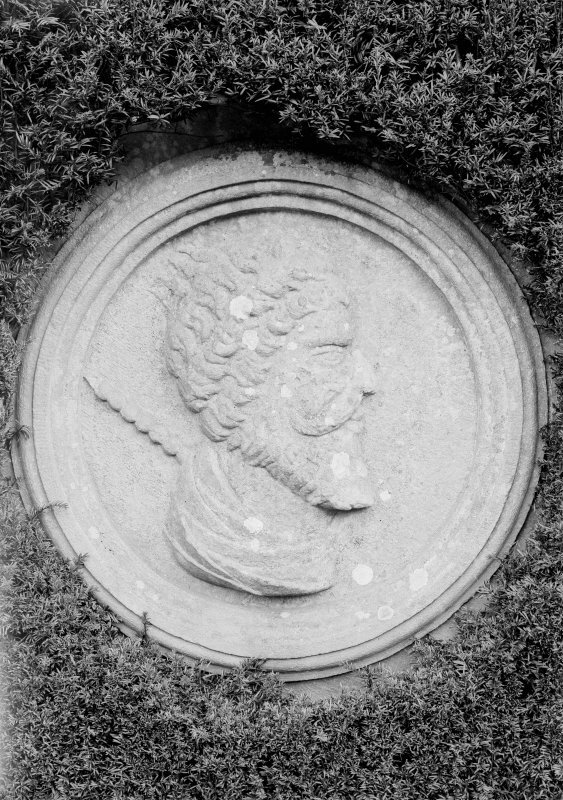 Roundel set into wall of formal garden. 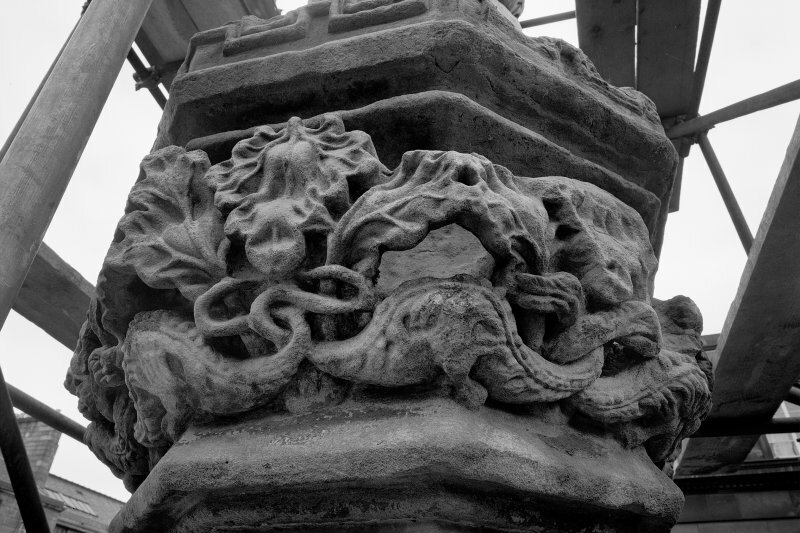 Originally from Edinburgh - Mercat Cross. 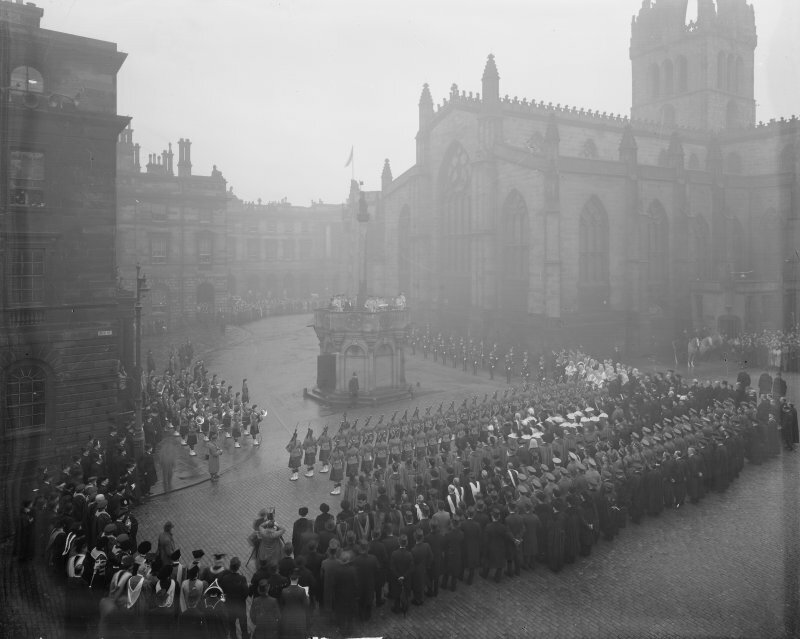 Proclamation of the Accession of King George VI in Edinburgh. 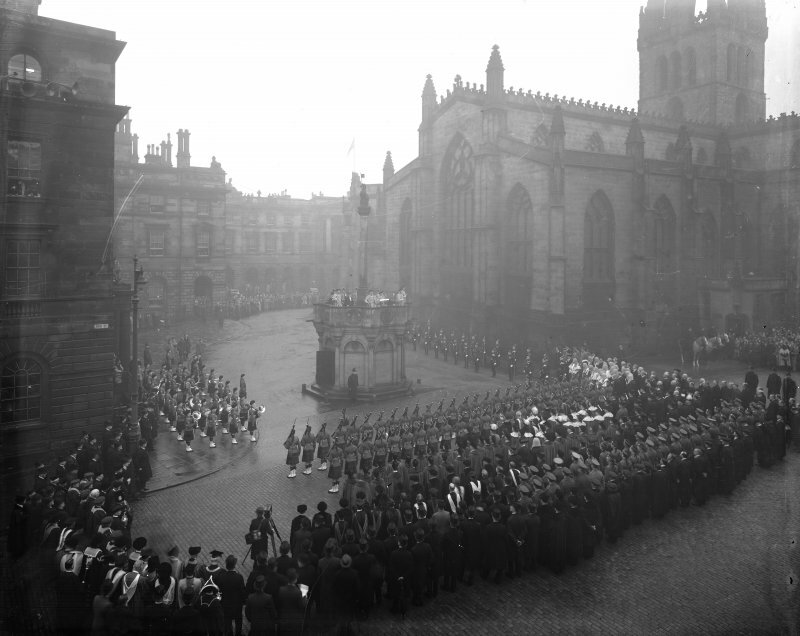 From left to right on Mercat cross, Captain HAB Lawson, Unicorn Pursuivant, Thomas Innes of Learney, Albany Herald, Sir Francis Grant, Lord Lyon King of Arms, Sir Alexander Hay Seton of Abercorn, Carrick Pursivant and Lt. Col. JW Balfour Paul, Falkland Pursuivant.Ceremony in Parliament SquareProclamation of the Accession of King George VI. 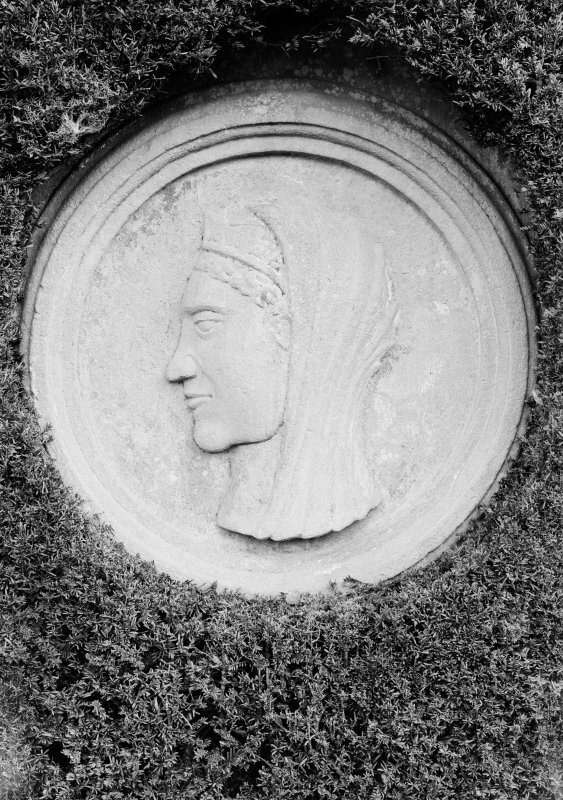 Carved roundel set into wall of formal garden. 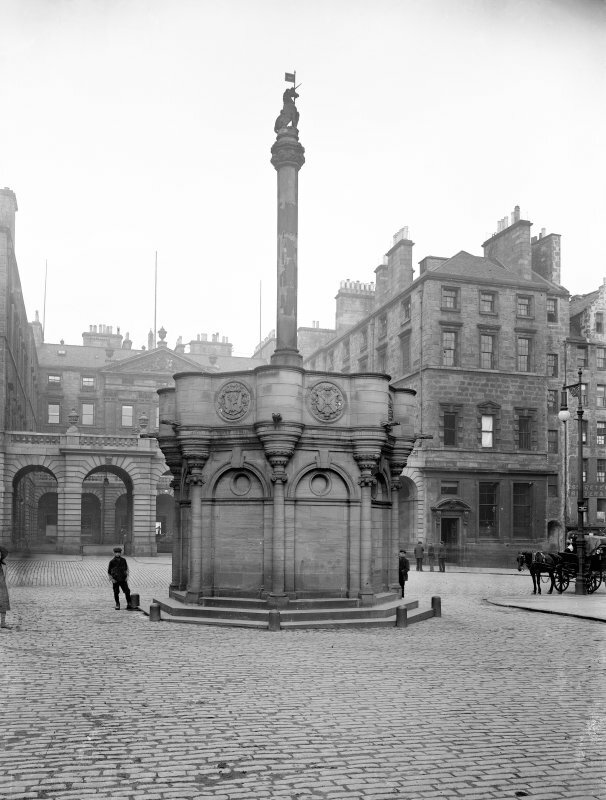 Originally from Edinburgh, Mercat Cross. 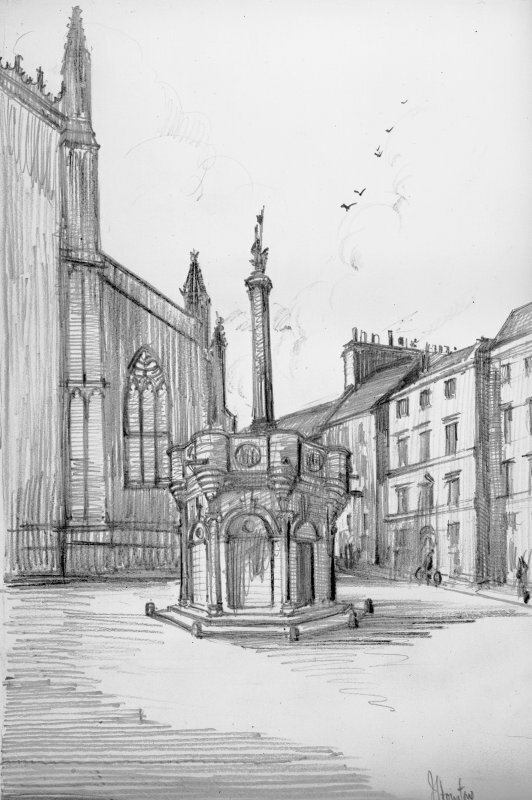 The Mercat Cross of Edinburgh is first mentioned in a charter of 1365 which indicates that it stood on the S side of the High Street, about 45ft E of the present E end of St Giles' Church (at NT 2577 7360). 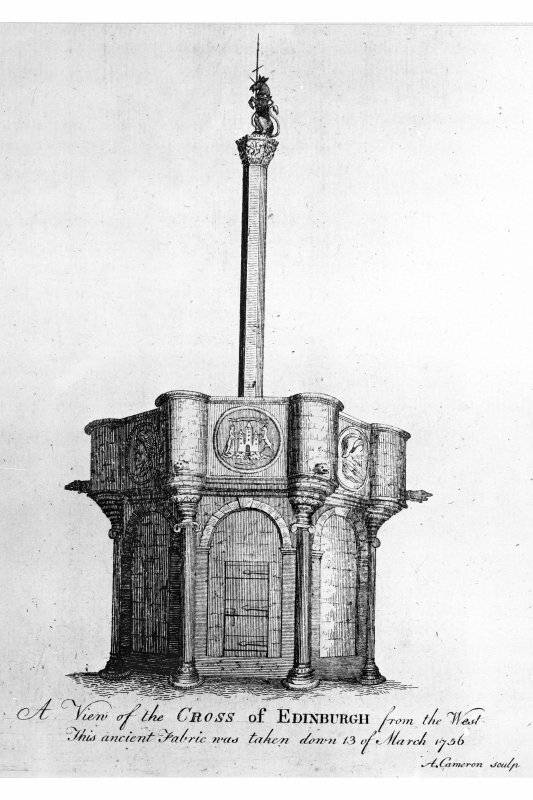 In 1617, the cross was taken down and re-erected on a new substructure lower down the High Street (at NT 2579 7361). This site is still marked by an octagonal arrangement of cobble stones. 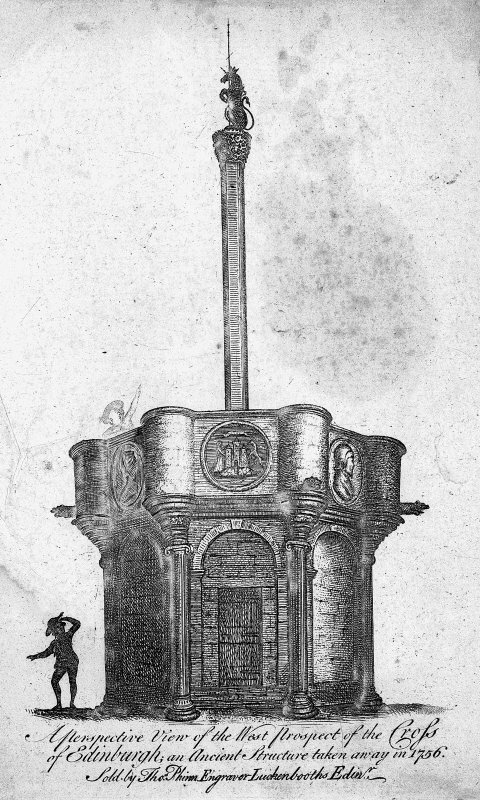 In 1756, the cross of 1617 was demolished; some parts were preserved, notably the capital and parts of the shaft, and re-erected at Drum House, Gilmerton (see NT36NW 35). Five of the eight circular medallions that had adorned the understructure are now built into the garden wall at Abbotsford (NT53SW 41), where there is also the basin of a fountain from which it is said that the central pillar of the Cross origianlly rose. 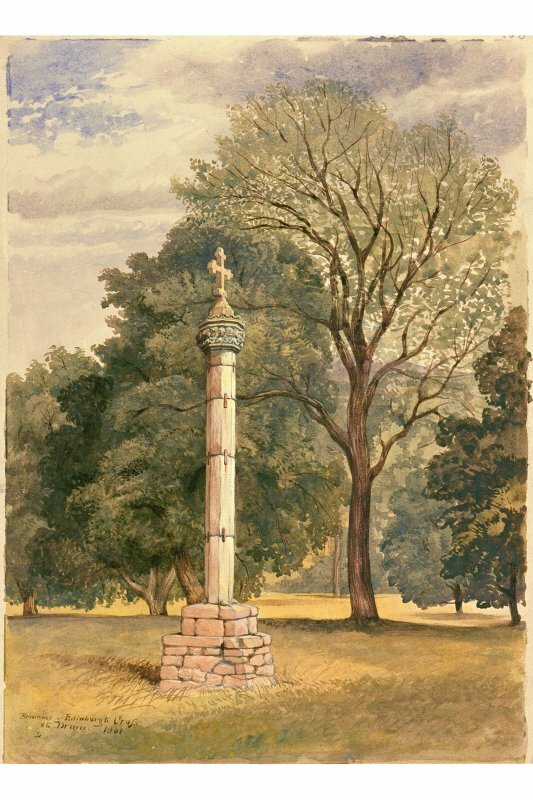 A small oblong finial of freestone, which once formed part of the Cross, is preserved in the garden of Viewforth, Cammo Road, Barnton; it is dated 1641. 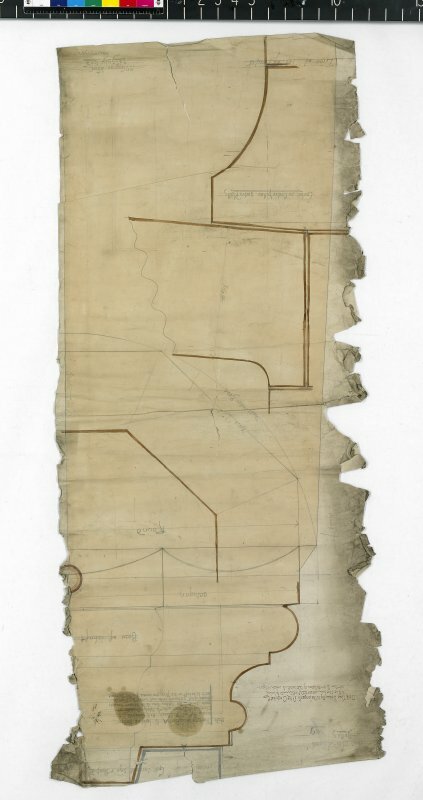 The shaft, prior to 1756, was a single stone, but was broken, and five pieces were dressed square and clamped together to form the shaft at Drum, 13ft 11ins high. 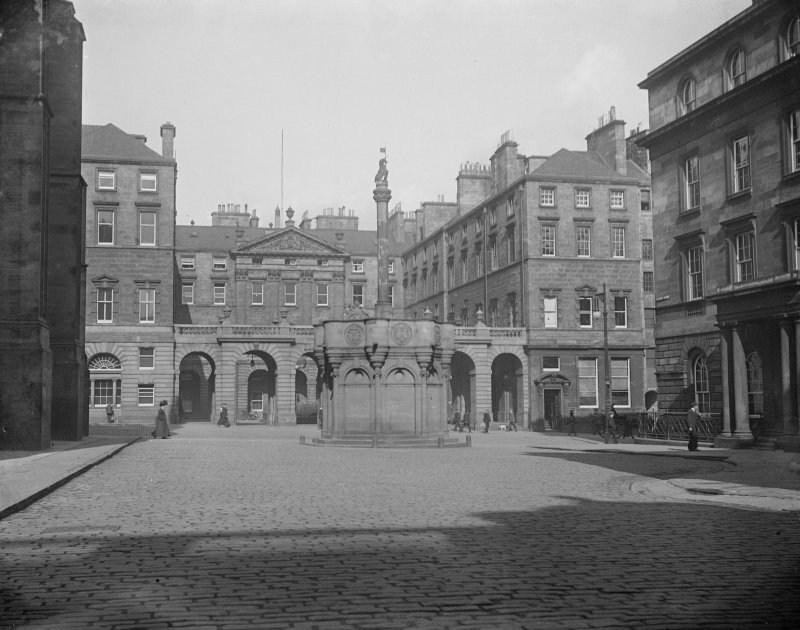 In 1866, the pieces from Drum House were set up on a new pedestal within the railings on the N side of St Giles' Church. 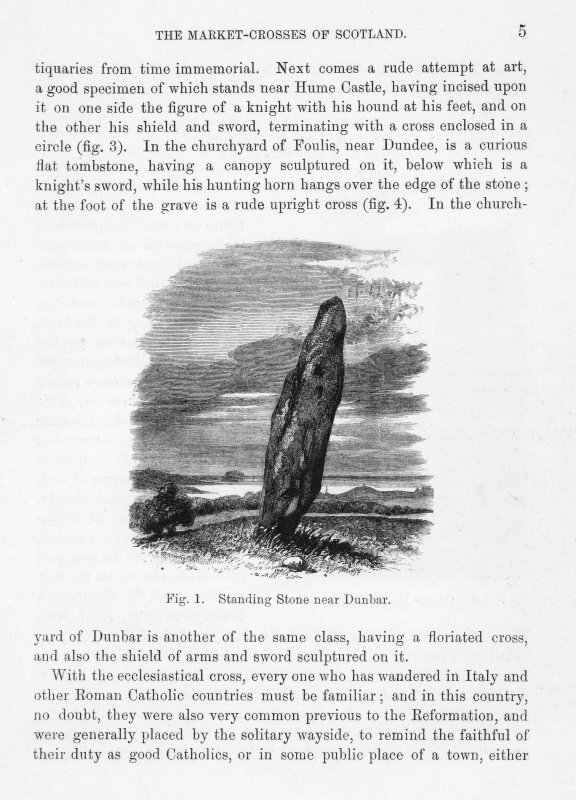 In 1885, a new substructure was commissioned, and the cross was rebuilt on its present site. 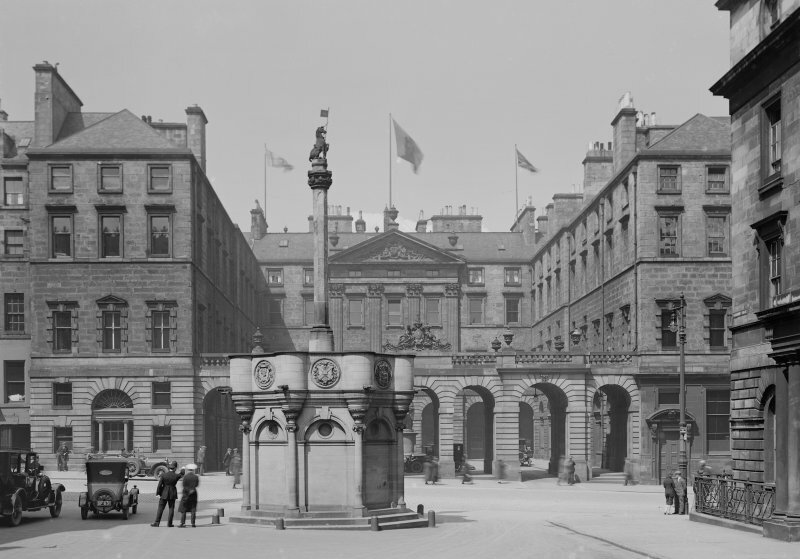 Finally, in 1970, Edinburgh Corporation replaced the shaft, preserving the unicorn finial, the capital, and two pieces of one of the old shaft stones. 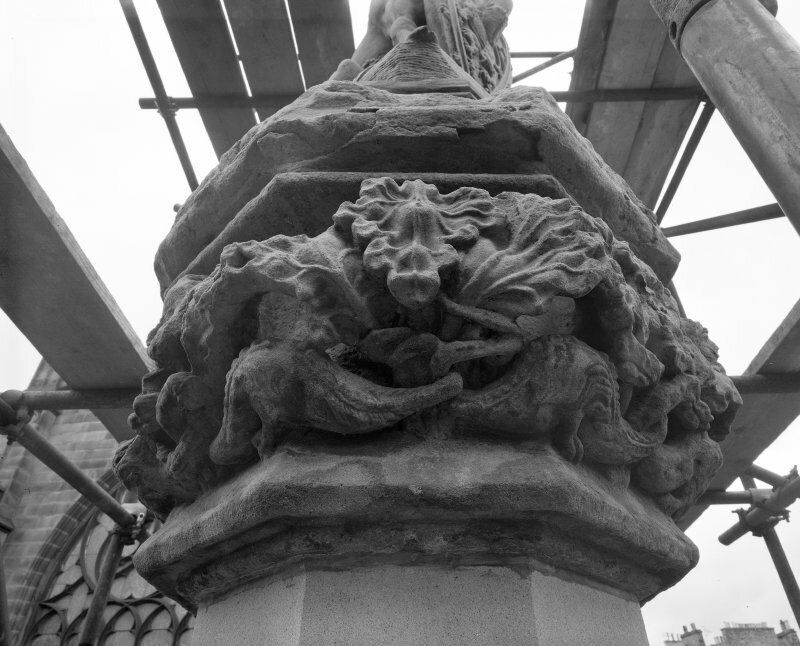 The RCAHMS, who examined the capital in 1971, concluded that it belongs to the first half of the 15th century. 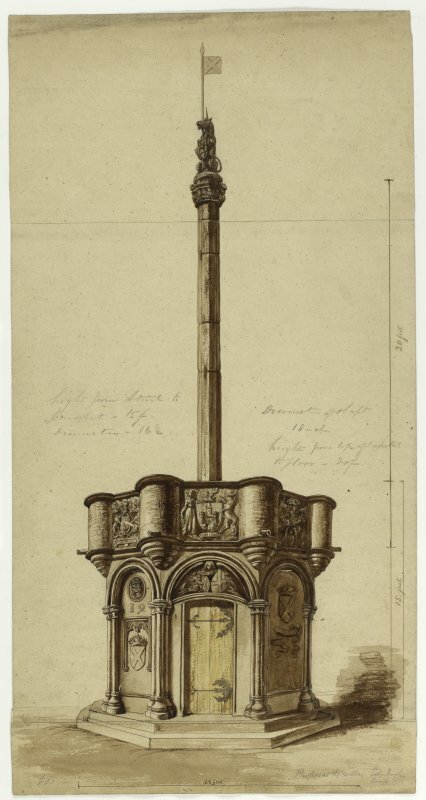 The unicorn finial was set up in 1869 to represent the unicorn mentioned in accounts of the 1617 cross. J C Robbie 1908; RCAHMS 1951; S Harris 1972. 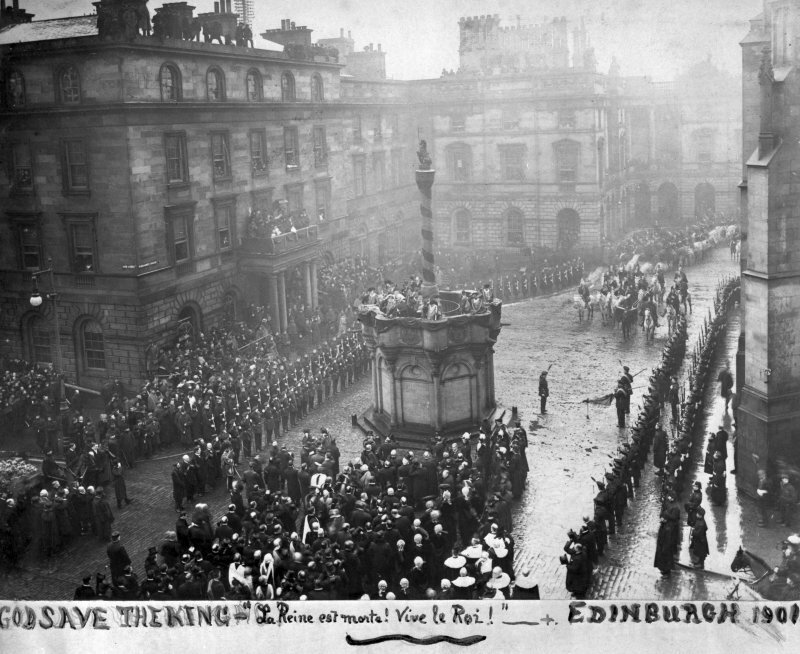 See also EDINBURGH, High Street, City Chambers for photographs. 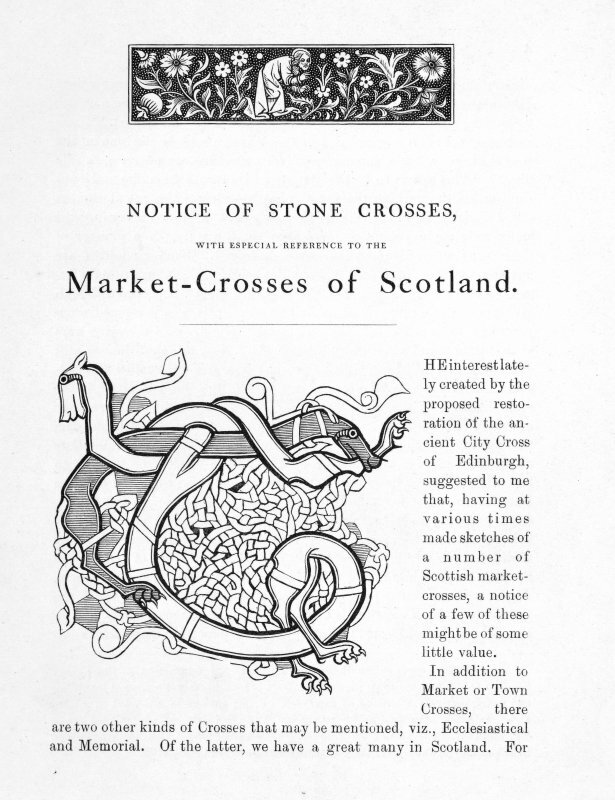 Robert Louis Stevenson's "Edinburgh"-a sketch entitled "A Royal Proclamation"
"History of the Mercat Cross of Edinburgh" by Thomas Arnold, 1885- "Prospect of ye Mercat Crosse of Edinburgh 1750" and a reduced copy of the Architect's drawing of "The Market Cross as restored in 1885". 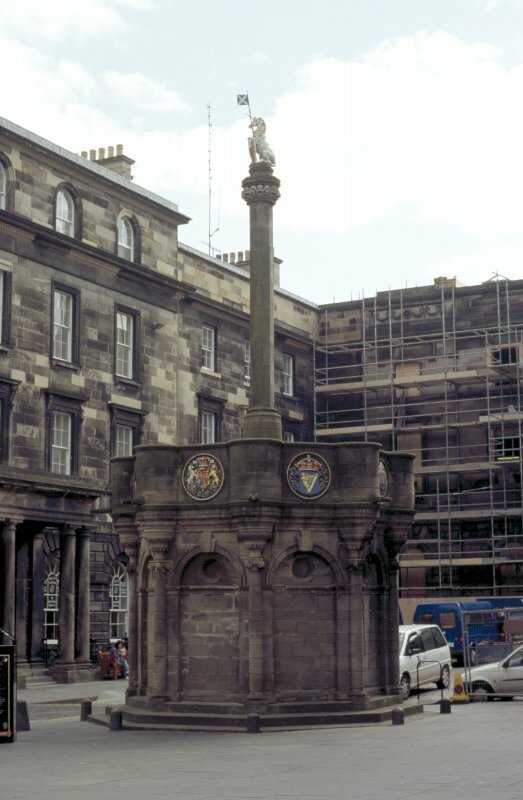 White and gilt unicorn with a red and white shield carrying a saltire pennant sits on top of a capital carved with dragons and foliage (the only original part), which surmounts a tall octagonal shaft; the whole supported by an octagonal drum with eight coloured heraldic medallions (one on each side with the city arms facing the High Street). The structure can be entered and provides a platform for proclamations. 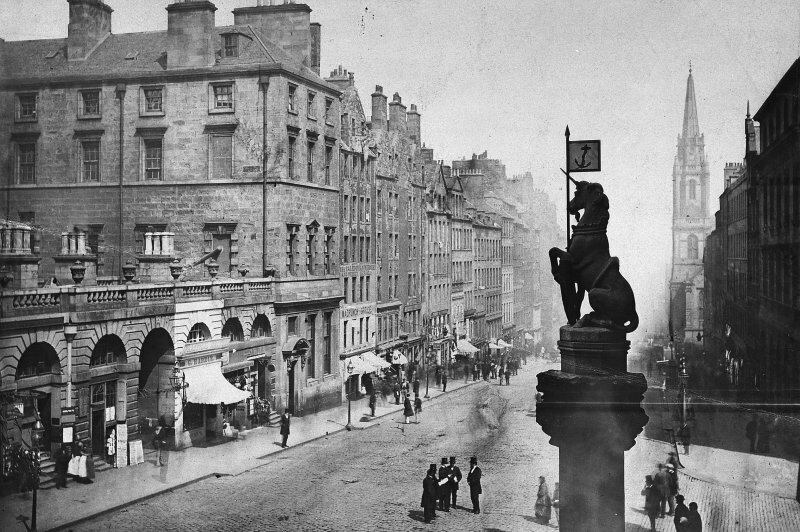 The first Mercat Cross stood in the middle of the High Street until 1617, when it was taken down 'to give greater effect to the royal procession of James VI on hid first visit to Scotland after his accession to the English crown.' 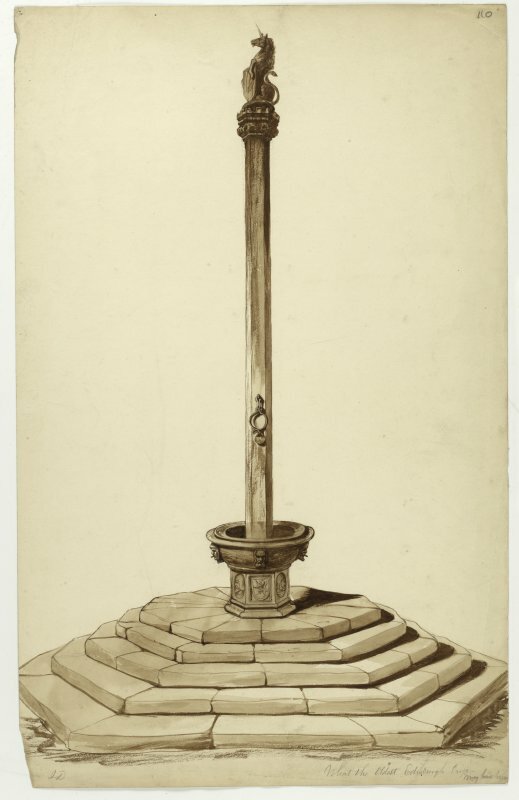 (1) After the visit, the foundation of a new cross was laid a few yards to the south of the former site and the shaft of the old cross was placed on a new octagon building about 16 feet across. 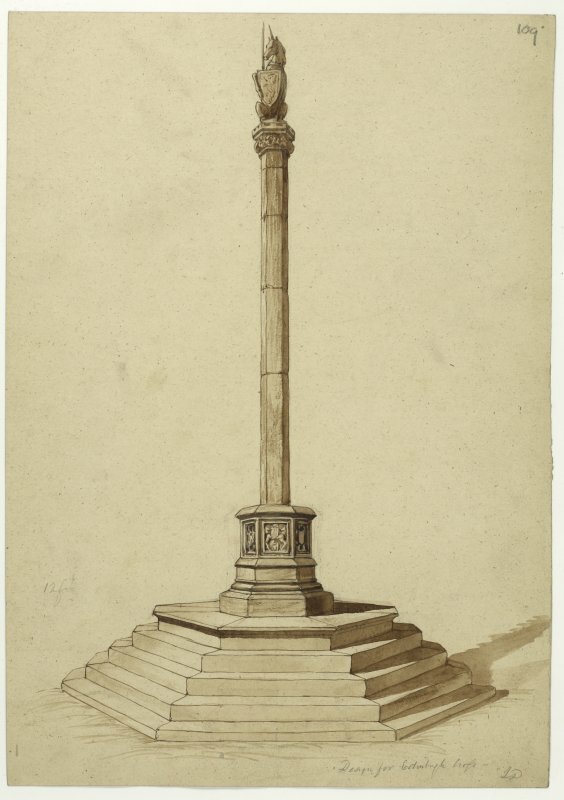 In 1756 this cross was ordered to be removed, because it was considered an encumbrance to the street. 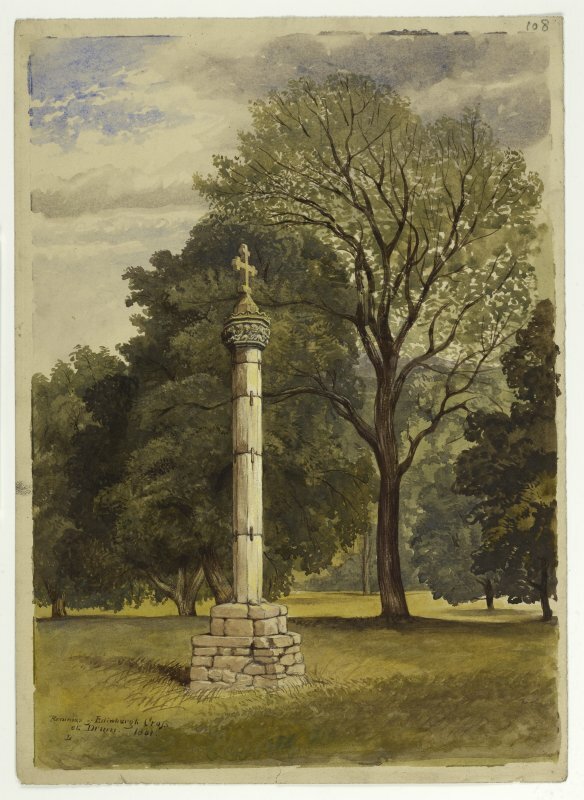 In 'Marmion', Sir Walter Scott laments this removal: "Dun-Edin's Cross, a pillar'd stone, / Rose on a turret octagon; / But now is razed that monument, / Whence royal edict rang, / And voice of Scotland's law was sent / In glorious trumpet clang. / Oh ! be his tomb as lead to lead / Upon its dull destroyer's head ! - / A minstrel's malison is said." In March 1885 William Ewart Gladstone M.P. 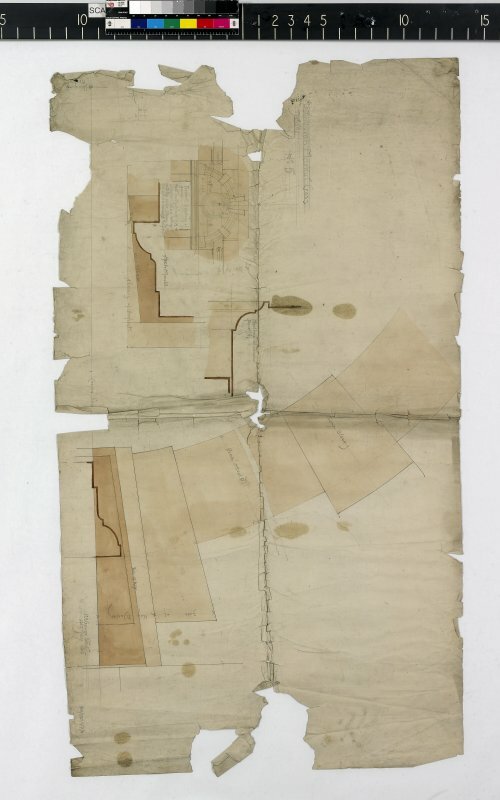 wrote to the Town Council of Edinburgh expressing his desire to undertake the restoration. 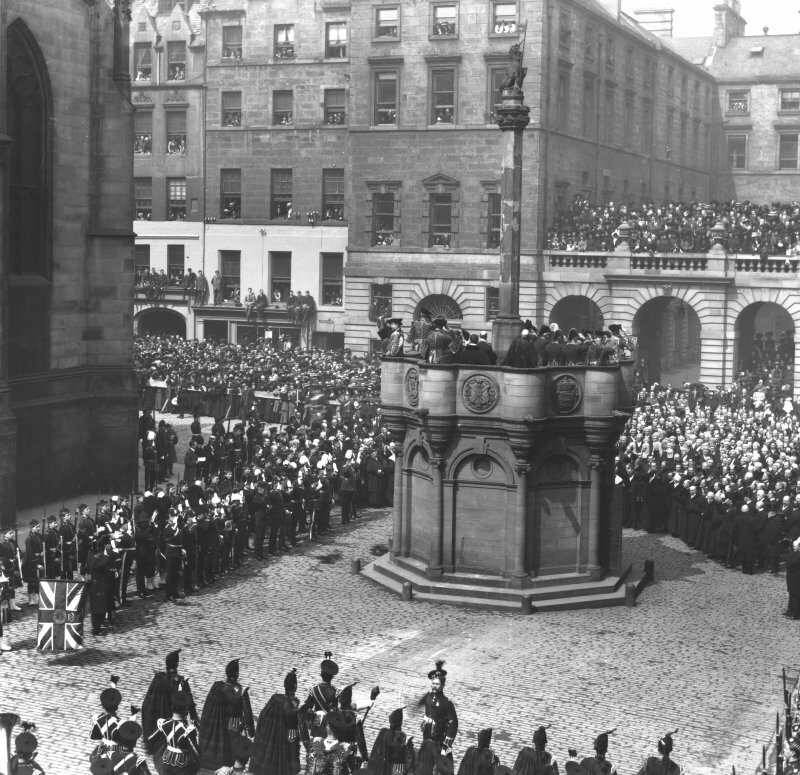 On 23 November 1885 the Town Council of Edinburgh took over the custody of the Mercat Cross, by accepting the key from William Gladstone.